DefiDev develop and manufacture complex solutions for Smart Metering and Smart Grid infrastructure project focused on BPL (Broadband over Powerline). By providing high-speed data transmission through existing LV and MV lines by using high frequencies (1 to 34 MHz), the BPL technology is currently taking a leading position as increasingly considered by energy providers wishing to upgrade their networks infrastructure. The DefiDev BPL solution thanks to its transmission stability transform the delivery of electricity. 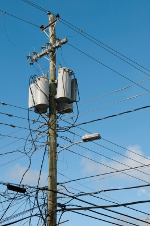 This Smart Grid solution significantly improves the transmission distance and data capacity. Control of their own infrastructure quite opposite of the telecom solution and can be adapted to the telecommunication technology already inside the household as Wifi...Which allows to multiply the field application. Using its BPL meter communication modules, DEFIDEV can provide communication capabilities to meters from industry-leading manufacturers. Deployments are easy and risk-free using the DEFIDEV Management software. In this achitecture the bpl modem is embeded in the electricity meter with a directional coupler services named Speedy meter. With this solution Services do not shutdown when the contactor is off and the quality of the BPL signal is not dependant to home appliances.